Come participate in Cal Poly’s Design Village, a competition hosted by the architecture program! This year’s theme is SYNTHESIS, the combination of ideas to form a theory or system. The College of Architecture & Environmental Design offers five interrelated degree programs of the built environment and experiential learning opportunities for students. In the 2018-19 DesignIntelligence Survey, Cal Poly's architecture program was also Best in the Nation for seven design focus education areas. The ARCE Department received the 2018 American Society of Civil Engineers Walter LeFevre Award. A City and Regional Planning graduate class was recognized for its Ventura Urban Design Plan. Construction management students built and donated two tiny home structures to local nonprofit Hope's Village this spring. The landscape architecture program received impressive Top 5 rankings in the 2018-2019 DesignIntelligence Survey. 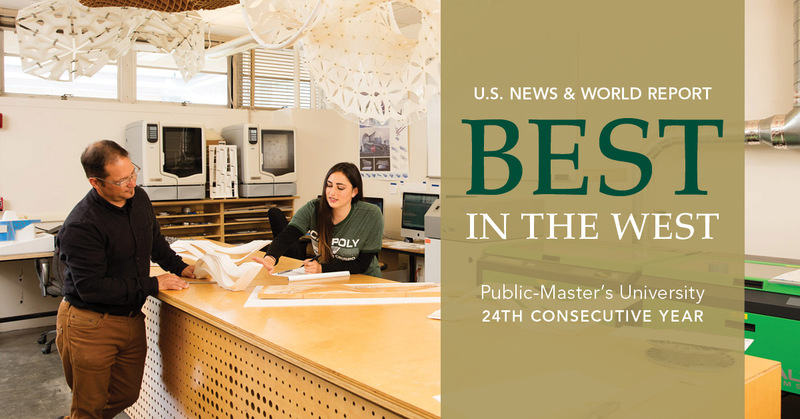 Cal Poly is once again ranked the number one public, master’s-level university in the West by U.S. News & World Report.